Located on a lake, this family-friendly hotel is within 25 mi (40 km) of Castle of the Duke of Pomerania, Darlowo Port Beach, and Park of the Pomeranian Dukes. Uniescie Beach and Mielno Beach are also within 32 mi (52 km). Situated in gmina Polanów, this hotel is within 25 mi (40 km) of Castle of the Duke of Pomerania, Darlowo Port Beach, and Koszalin Museum. Park of the Pomeranian Dukes and Saint Mary's Cathedral are also within 32 mi (52 km). Offering direct access to the beach, this Darlowo hotel is 0.7 mi (1.2 km) from Lake Bukowo Marina and within 9 mi (15 km) of Darlowo Port Beach and Castle of the Duke of Pomerania. Uniescie Beach and Mielno Beach are also within 20 mi (32 km). This family-friendly Darlowo hotel is located by the sea, 1.4 mi (2.3 km) from Lake Bukowo Marina, and within 9 mi (15 km) of Darlowo Port Beach and Castle of the Duke of Pomerania. Uniescie Beach and Park of the Pomeranian Dukes are also within 20 mi (32 km). How Much is a Hotel Room in Krag? Hotels in Krag start at $29 per night. Prices and availability subject to change. Additional terms may apply. Visitors to Krag are advised to think about booking somewhere to rest and relax well in advance of their departure date, as they won't find a large number of accommodation options near the center of town. The Schlosshotel Podewils, is a convenient hotel for the busy traveler due to the fact that it's the most centrally positioned hotel choice in Krag. 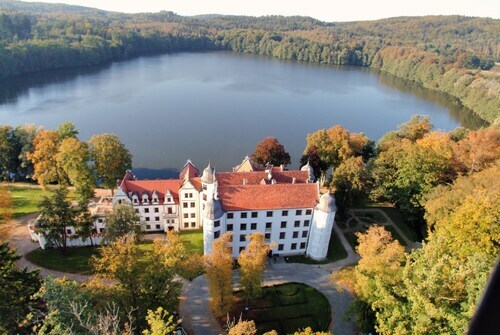 The Schlosshotel Podewils is 0.05 miles (0.08 kilometers) outside of the city center of Krag. The wider Baltic Sea Coast - Pomerania district is well worth visiting too. Baltic Sea Coast - Pomerania offers beaches and coastal plains, and commonly visited destinations include ruins, castles and old towns. Common things to do in this particular area of Poland include mountain climbing. 20 miles (36 kilometers) from Krag, you can reach Koszalin, where you can spend the day visiting Koszalin Museum and Saint Mary's Cathedral. 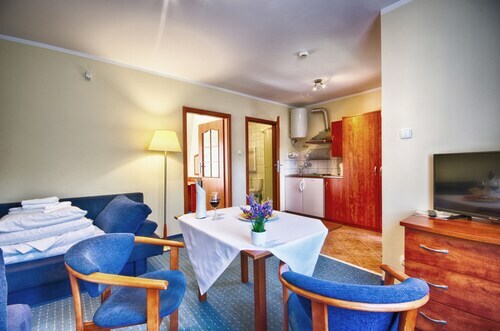 When you stay in Koszalin, check out the rooms at the Hotel Gromada Koszalin and Apartamenty Centrum. 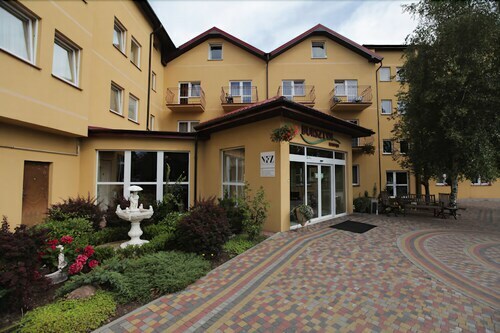 For another option, stay in Ustronie Morskie, 40 miles (61 kilometers) to the west of Krag, where you'll find the Hotel Lambert Medical Spa and Boulevard Ustronie Morskie. Should you choose to stay in Ustronie Morskie, set aside some time to check out the Municipal Sports and Recreation Center and Ustronie Morskie Church. Lech Walesa Airport is a major entry point for flying into and leaving Krag. It's located 70 miles (116 kilometers) from the center of the city. If you choose to find a base nearby, book a room at Hampton By Hilton Gdansk Airport or Lezno Palace Hotel.